It’s whether you feel stuck in life or whether you feel like life is flowing. This mindset has a huge impact on your health and vitality because your body is a microcosm for the macrocosm of your life. What goes on in your life affects your body. When you feel stuck in life, life is not flowing and this affects the flow of qi in your body. Qi is your life force energy, and it needs to flow just like water must flow through a river. When qi is not flowing as it should, this affects all of your body’s functions, systems and processes because qi helps move the physical elements in your body—everything from breathing, digestion, urination, bowel movements, and the flow of lymph and blood. All of these elements are propelled by your body’s qi. Thus, to improve your health and vitality, you need to get your qi flowing. But if you only tackle health at the physical level, then you’re not addressing the macro issue, which is getting the energy flowing in your life. That’s why I created my podcast, Holly Tse: Express Your Brilliance with Ease and Flow. The Holly Tse Show addresses the root cause of why people get sick in the first place: life’s not flowing, so qi is not flowing. Your body is a reflection of what’s going on in your life. Illness is a message to bring your attention to something that you’ve been ignoring, sweeping under the carpet, or it’s something that you are very aware of, but feel stuck or unable to take action and change. This selection of podcast episodes will help you get back into the flow of life. Tune in to move forward, feel at peace with where you are today, and be confident, excited and inspired to take action for where you’ll be tomorrow. Let’s get started with a podcast to get the qi flowing in your body. This meditation is especially helpful if you have tension, stress, or pain anywhere in your body. We’ll methodically (in a flowy way!) go through each part of your body to move qi for greater ease and flow. You’ll be amazed at how flow in your body extends to flow in your life. Listen to this podcast for a new twist on meditation, where the focus is on creating ease and flow in your body that expands into your life. You’ll see how your body is a microcosm for life, and how tuning in to your body allows for flow and expansion in all areas of your life. Episode 011:) How to Be. Present. In This Moment. Wait a second… Wasn’t this a collection of podcasts for moving forward? Then, why is there one focused on the present? Your mind might already have told you to skip this one because it sounds boring. If so, YOU especially should listen to this episode because the value of presence is totally underrated, yet being present in the moment is immensely powerful—for your future. How ironic! Tune in to be present. And discover the multitude of benefits that even a moment of presence can have for creating your entire life: past present and future. If you feel stuck in your current situation—like you have this huge potential, but are unable to realize it—this Dragon Spirit meditation will help you close the gap between where you are now and where you see yourself in the future. Get into the flow of life for a renewed sense of optimism and inspiration, and feel it in every cell of your body that you can do it! After listening to the previous episodes for more ease and flow in your body and mind, here’s an episode to really get your creative juices flowing. Inspiration is always the catalyst for change. Tune in to discover the creative ideas and inspiration that are ready to spring forth—as soon as you stop to listen. This episode includes a Dragon Spirit meditation that transcends time and space to take you back to the original source of creative blocks. If you ever get excited about a project only to hit a wall, discover how to clear unconscious thought patterns that block your creativity so that you can unleash your creative spirit and express your creativity with ease and flow. Discover a wellspring of inspiration, brilliant ideas and enhanced creativity. New episodes are released every Monday morning. 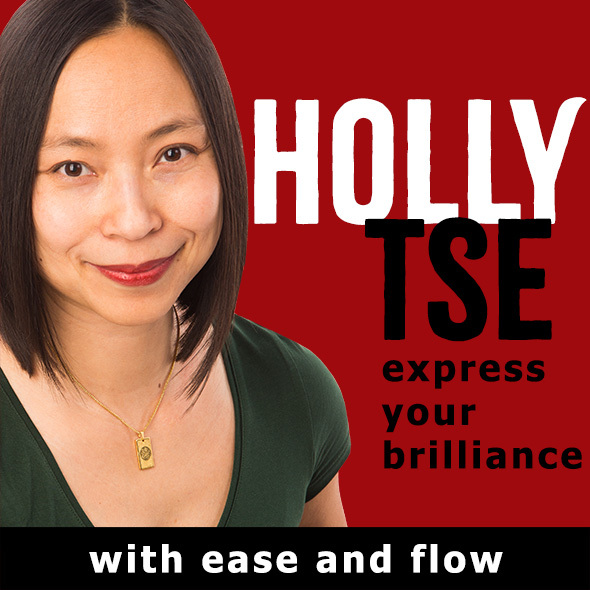 You can find every episode of Holly Tse: Express Your Brilliance with Ease and Flow on my podcast website, HollyTse.com. You’ll also find episodes on iTunes. Check Apple’s Podcasts on your iPhone or iPad, and search for “Holly Tse”. If you enjoyed my podcast, please subscribe to the show on iTunes, leave a rating/review on iTunes, or share it with your friends and family. A few seconds of your time really helps me get the word out on my podcast. That gives me more time to make more podcasts! As a full-time mom, I appreciate your support in spreading the word. The Universe works its magic through you!